It’s absolutely heartbreaking. It makes me recall the end of my first relationship; the following month where I couldn’t do anything but swallow myself in misery and loss. 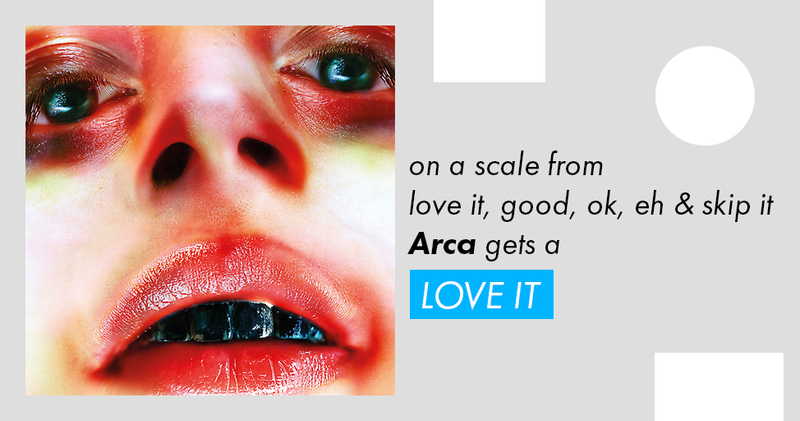 Arca’s, or Alejandro Ghersi’s self-titled LP intensely nails those emotional reverberations that happen after an end to a love tryst in the way the solemn lyrics and somber melodies liquefy. The aggravation is impenetrable and punches through each one of the 13 tracks. “Piel” opens on Ghersi humming before calmly uttering “Quítame la piel de ayer,” the itch to leave behind yesterday’s skin and become a whole new person. Meanwhile, a sharp signal, like the beginning of an old news bulletin on TV, breaches behind his words shamelessly. As the simple expression of loss swells, so does the impending darkness. It purposefully zeros down on anyone who has went through similar tribulations that needed to leap over a hurdle of mass sadness with no end in sight. It doesn’t get any better as Ghersi pines for the ex-lover on “Anoche,” which translates to “Last Night.” His operatic-like vocals softly plea to whoever would listen, “Anoche yo te amé, Y tú me dejaste trizas,” which refers to how he was left–shattered. It’s a dangerous rabbit hole made of breezy melancholy and maturity. Relatively short instrumental-based tracks including “Saunter” and “Whip” act as explosives betwixt mellow love-induced comas, or tracks. “Saunter” fills the atmosphere with falling static rain and grand synth keys building up to the same but powerful interjection, “Quítame la piel de ayer.” “Whip,” in a completely different way, masks the air with messy bull whip lashes, feeling the beat down of love-sickness, or trying to slash the internal pain away. It’s these outbursts that remind Arca that there’s still feeling outside his dejected state. As if Ghersi was producing Arca while in a cloud of deprivation, he flawlessly captures the mood and lodges the listener deep inside the grasp of abandonment. In “Fugaces,” he justifies the need for escape from the hopeless walls that surrounds him by singing “No, no quiero vivir preso de la melancolía” (No, I do not want to be a prisoner of melancholy). It feels as if he shouldn’t have survived to publish the album, but he did, and it’s lovely. LOVE IT.